In Queensland, May marks Domestic and Family Violence Prevention Month. Across the state, industries and communities come together to raise awareness for domestic and family violence, showing their support for victims and spreading the message that domestic violence in any form will not be tolerated. 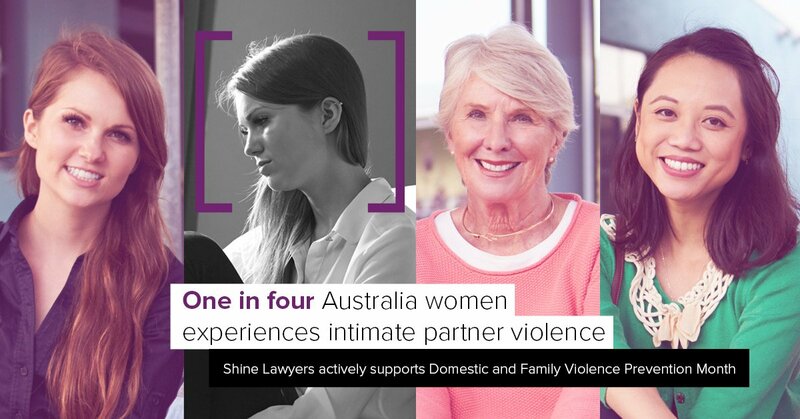 This May, Shine Lawyers are proud to actively support Domestic and Family Violence Prevention Month. At the end of April, the Federal Government announced that after much public and professional protest, they would be withdrawing the proposed funding cuts to legal aid services across the country. The funding reduction would have seen a $55.7 million loss over a three-year period to much needed legal providers. Instead, the Federal Government has committed to an increase in funding for community justice services, with priority given to providers of domestic violence legal aid. This decision shows the importance of accessible legal aid in combatting domestic violence, and is a big win for Australian support services. However, there is still a long way to go to ensure victims of domestic and family abuse have access to the legal support they need. Gaining access to legal aid remains one of the many problems faced by sufferers of domestic and family abuse. Due to shortfalls in the system, limited funding for organisations and high demand for services, qualifying for legal support is a difficult and exclusionary process. Applicants must meet various sets of stringent criteria and many are unfortunately turned away. As noted in a 2014 report by the Productivity Commission, 14% of the Australian population live below the poverty line, yet only 8% of those are deemed poor enough to access legal aid. Strict means-testing for legal aid means legal support cannot be accessed by thousands of Australians who are still unable to afford legal representation. Victims of domestic abuse are particularly disadvantaged; the test takes into account a victim's joint assets, which many cannot access following separation, divorce or economic abuse. Although domestic violence is considered a top priority under legal aid testing, funding is only granted to those applications that are deemed likely to succeed in court. Evidentiary issues and time limitations are only a few of the many legal barriers that can tarnish the prospects of a victim's case. As a result, many victims become ineligible for much needed representation. The Federal Government's announcement is certainly a positive step toward rectifying these shortcomings and increasing access to legal support services for sufferers of domestic abuse. An increase in funding to legal aid, particularly specialised domestic and family violence services, will go a long way in boosting needed resources so these organisations can support the millions of victims across Australia. The announcement also provides an opportunity to increase funding for other support networks such as accommodation assistance, mental health services and financial assistance. It is through strong, united support services that we, as a state and as a country will be able to put a stop to domestic and family violence and create a world where victims can live without fear. If you are experiencing domestic or family violence, or are concerned about a loved one, reach out to a support organisation near you for help. Written by Shine Lawyers on May 15, 2017. Last modified: August 31, 2018.